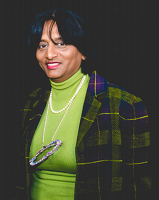 Prof. Jayanthi’s research focuses on the development of methodologies for large-scale simulations based on robust semi-empirical Hamiltonians with the goal of determining the structure-property relationships of novel complex materials with reduced symmetries. Using these methods, she has studied unusual electro-mechanical responses of single-wall carbon nanotubes, colossal magnetic responses of carbon nanotori, phonon modes in capped carbon nanotubes, etc. Her recent research interests include studies on the structural and electronic properties of SiC clusters, SiC nanowires, and two-dimensional boron sheets. One of the goals of these studies has been to design materials with improved properties for the next generation of electronic devices. L.Liu. G.Y. Guo, C.S. Jayanthi, S.Y. Wu, Physical Review Letters 88, 217206 (2002). S.Y. Wu and C.S. Jayanthi, Physics Reports 358 1-74 (2002).